Owner, Matt Fockler at the helm of his boat. 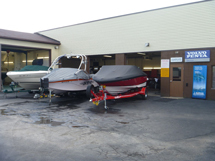 Starboard Marine Repair is a full service marine repair facility that specializes in stern drive and inboard boat repairs. We offer a full line of mechanical as well as extensive cosmetic and structural repairs on fiberglass. We do not service outboard motors. 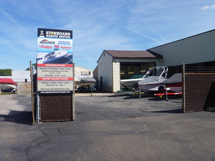 Starboard Marine Repair was founded in 2004 by Matt Fockler, who previously worked for 15 years at three major marine dealerships in Northeast Ohio, where he acquired a broad range of skills and experience servicing new and used boats. Matt and his staff have gained a family of satisfied customers by offering honest and quality service. That’s why the majority of Starboard’’s new customers have come on board as referrals from a host of satisfied customers. Our family of satisfied customers are not only from northeast Ohio, but the entire state. We have serviced boats from neighboring states as well as Canada. As fellow boat enthusiasts, Matt and his staff know the importance of having your boat available for those summer days that are gone before you know it. We strive to provide prompt service and value that surpasses the competition. Staffed by trained, experienced, factory-trained technicians, our service facility features four service bays, a paint booth, fully equipped wood shop, 3-ton overhead crane, hydraulic boat lifts, on-site dynometer testing and computer diagnostics equipment. Owner and Lead Technician with 22 years in the marine industry. Marine technician, Customer service and 15 years in business management. Mercruiser technician. Over 30 years experience in marine repair. Bring your boat to us for uncompromising service. Three work bays and our paint booth.